So what kind of impact can you make with a Twitter party for social good? 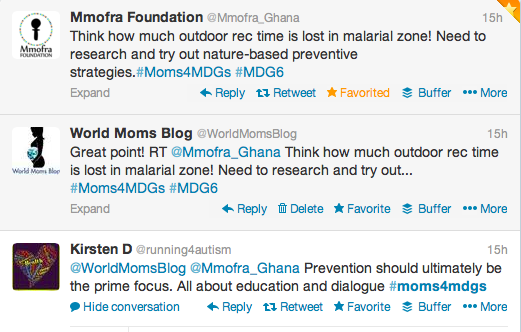 Last night, after our #Moms4MDGs chat, we ran a TweetReach report. 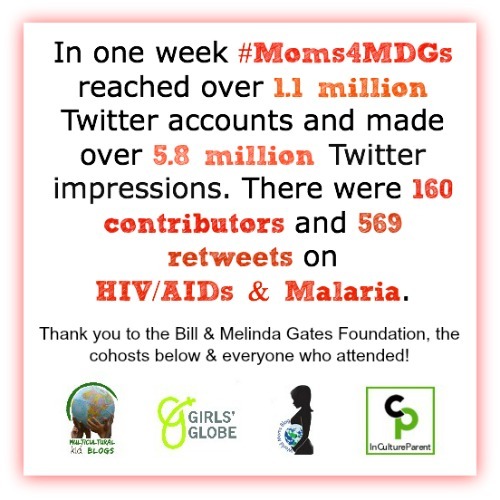 In the past week, our collaborative efforts under the #Moms4MDGs hashtag have reached over 1.1 million Twitter accounts and made over 5.8 million Twitter impressions. There were also 160 contributors to the hashtag and 569 retweets. Tweeters from North America, South America, Europe and Africa joined in! The #Moms4MDGs campaign was announced last July at the BlogHER conference’s International Activist’s Panel by World Moms Blog Senior Editor, Purnima Ramakrishnan, in Chicago, Illinois, USA. We were answering the call to action to keep moms engaged with the world’s goals on topics such as eradicating extreme poverty and empowering women and girls. There are 8 Millennium Development Goals, and we have been covering one per month and have teamed up with a different organization each month that works year-round toward a particular goal. The topic of yesterday’s #Moms4MDGs chats was on the UN’s Millennium Development Goal #6, to combat HIV/AIDS, malaria and other diseases. The key to tackling the world’s most pressing problems is teamwork. In the first party, we were joined by cohosts, Multicultural Kid Blogs, InCulture Parent Magazine, Girls Globe and our featured organization of the month, The Bill and Melinda Gates Foundation, who tweeted from @gateshealth. 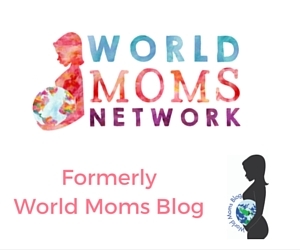 World Moms Blog and our contributors got the party started by welcoming guests! Then we passed the baton to cohost Multicultural Kid Blogs, who educated us on the targets for HIV/AIDS and statistics on progress and what still needs to and can be done to fight the disease. Next, the baton was passed to cohost InCulture Parent Magazine, who announced the targets for malaria, the seriousness of the disease, and what can be done to help. The UN Foundation and their campaign, Nothing But Nets, entered the twitter feed, which was really helpful to the conversation. And the party people chimed in! Then, cohost Girls Globe took the baton and asked the party some powerful questions to stir up ideas and action towards #MDG6. The Shot@Life campaign was also present and invited people to join them in the fight against disease and to become a Shot@Life champion when Girls Globe asked how moms of the world could get involved to reach #MDG6 goals. And Girls Globe brought up tech and MDG goals! Our interview was cut short during the first party with @gateshealth, but it left everyone something to come back for later that evening! Later, we learned how the Bill and Melinda Gates Foundation came about and more about their global blog, Impatient Optimists. And, they provided a mind-blowing statistic on polio, given that India was just declared polio-free for 3 years in a row this week. With two months still left in the 8 month #Moms4MDGs campaign, we are thrilled about how much MDG8, a global partnership for development, has played a role in all the parties throughout. 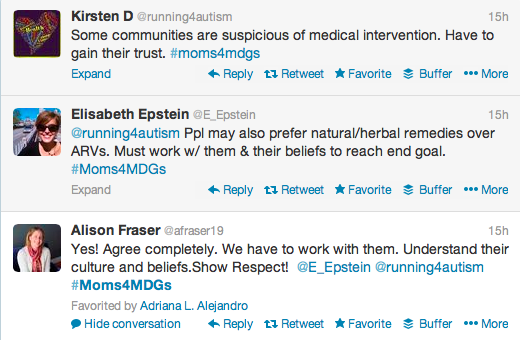 World Moms Blog is proud to be meeting interesting people on Twitter, connecting with other websites geared up to make a difference and partnering and featuring foundations that are making year-long contributions to the vital goals to end extreme poverty and increase global health that the world has set. Our next twitter party takes place on February, 15th, 2014 on MDG7, the environment from 1-2pm EST. We hope you will come out and join the momentum. Mark your calendars…! 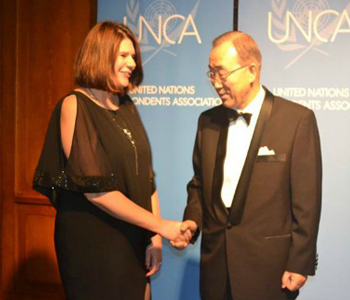 This is an original post by World Moms Blog Founder, Jennifer Burden in New Jersey, USA. It is so exciting to see that we are really getting our messaging out there and raising awareness! It is bound to make a difference! So awesome to see all these groups getting the word out!